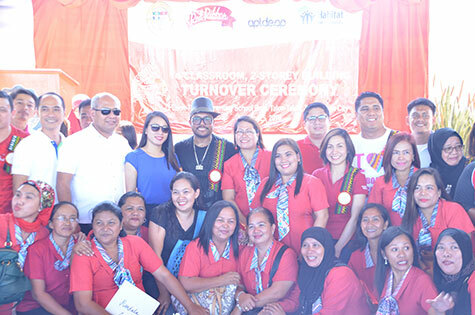 Red Ribbon—one of the leading bakeshop chains in the Philippines—together with Apl.De.Ap Foundation (ADAF) recently turned over a two-storey classroom building to Talon-Talon Elementary School in Zamboanga City to help bring the youth back to schools. 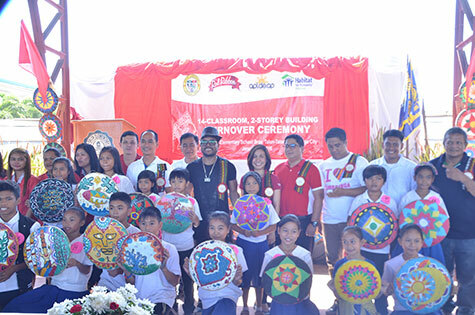 The ADAF is a non-government organization founded by Allan Pineda (aka Apl.de.Ap) of the Grammy Award-winning group Black Eyed Peas. Pineda attended the turnover ceremony along with a few representatives from Red Ribbon and Habitat for Humanity. A total of 14 classrooms were built inside the school’s premises; these classrooms are to be occupied by new elementary school pupils on top of its existing 64 students. The first seven new classrooms are set for the use of SPED Gifted and Talented classes starting from kindergarten to grade six, with one advisory class per grade level. Twenty eight students that need SPED are expected to occupy each of these classrooms. The eighth classroom will be used by the 41 students who fall under its SPED Non-Graded category, seated as one class and under the responsibility of three SPED teachers. The remaining six classrooms are intended for the use of third graders, each accommodating 53 students. 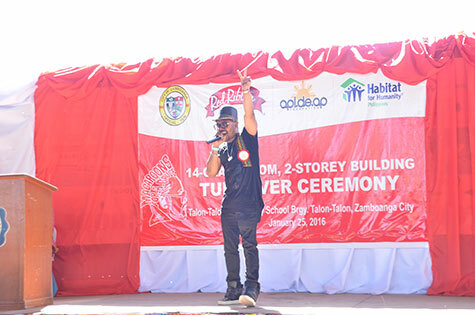 According to Zinnia Rivera, general manager of Red Ribbon, it was timely for Talon-Talon Elementary School to receive these new classrooms since the number of its students spiked from 6,169 in SY 2014-2015 to 6,412 this SY. Habitat’s Chief Operating Officer for Disaster Response, Tots Escalada thanked Red Ribbon and ADAF for their efforts in helping the children of Zamboanga go back to school. “Schools are children’s second homes. In Habitat, we want to help them have a more conducive place to learn, play and enjoy their childhood. We are very grateful to our partners for helping us give them that oppprtunity,” Escalada said. This is part of Red Ribbon’s Macaroons for a Cause initiative where the brand sold its best-selling macaroons nationwide for P50. For every pack of ‘Macaroons for a Cause,’ Filipino consumers were able to allocate 14 percent or P7 directly to the ADAF who will fund the project. Aside from the combined efforts of Red Ribbon and ADAF, the program was also supported by Jollibee Group Foundation and Habitat for Humanity Philippines. To know more about Red Ribbon, visit www.redribbonbakeshop.com. When guests are expected at home, serving a heavenly chocolate cake appears to be a sure crowd pleaser. Red Ribbon—one of the country’s biggest bakeshops—is bringing back one of its best-selling round chocolate cake that’s sure to delight your family and friends. Red Ribbon’s Rocky Road Cake is now making a grand comeback, carrying with it more delicious toppings that will definitely add more texture and flavor to the family’s time. Everyone has that one special food item that brings memories of home. Arguably for Filipinos, this is the classic Polvoron. Red Ribbon, one of the biggest bakeshops in the Philippines, introduces its Classic Polvoron—a delightful treat that bursts a melt-in-your-mouth sweetness and creaminess, leaving an aftertaste that’s sure to make Filipinos grab for more. According to Zinnia Rivera, general manager of Red Ribbon, the Classic Polvoron offers just the right amount of sweetness, with more “creamy sarap” goodness. The Red Ribbon Classic Polvoron comes in singles, pack of eights (8s) and box of 16s. The price ranges for each pack is P10, P73 and P143, respectively. Aside from the Classic Polvoron, Red Ribbon also boasts its other Polvoron flavors. This includes the Pinipig Polvoron, which bursts with the same creamy goodness complemented by crunchy pinipig bits; and the Peanut Polvoron, which contains flavorful real peanut bits mixed with powdered milk and lightly toasted flour and butter. For families who want to taste all three flavours, they can opt to purchase the Assorted Polvoron Pack. Now on its 36th year, Red Ribbon continues to make each celebration—whether small or grand—even more special. To date, the popular bakeshop chain now has over 300 stores nationwide. While saving on budget, you can also share the slices of the cake with 26 people because it has a base layer of 8×12 inches and a top layer of 6×8 inches. This cake is now available in all Red Ribbon stores nationwide. Red Ribbon introduces the cheesier Ensaimada! Perfectly balanced sweet-salty taste is ideal for any occasion. Pasig City, March 13, 2015 – Red Ribbon Bakeshop, one of the country’s largest bakeshops, today re-introduced one of its most-loved and best-selling every day pastry snacks. The Red Ribbon Ensaimada is now cheesier than ever. This beloved every day treat now has that perfect combination of sweet and salty taste that Filipino families have come to love and enjoy. The moist, soft, melt-in-your mouth bread comes overloaded with long, mouth-watering strands of cheddar cheese that is balanced with the right sprinkling of sugar for that sweet kick and topped off with a dab of creamy, delectable butter that you and your kids have loved all these years. Red Ribbon’s much-loved Ensaimada has been a staple in homes for many years and has been a part of many personal and family moments whether these are big celebrations like birthdays and anniversaries to simple, everyday moments like snack recess time. I invite everyone out there to try our cheesier Red Ribbon Ensaimada. This is guaranteed to make snack time so much more enjoyable,” added Rivera. Red Ribbon’ cheesier Ensaimadas are available at all Red Ribbon branches nationwide. 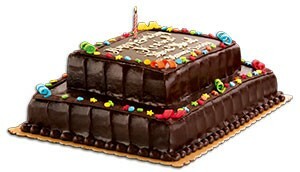 Or you may visit www.redribbonbakeshop.com to know more about our delicious cakes and pastries. 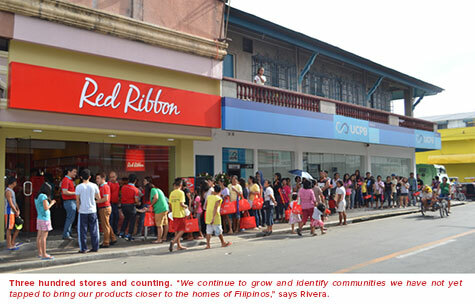 Manila, Philippines—Red Ribbon opened the doors to its first store in Nasugbu,Batangas—along JP Laurel Street, Barangay Poblacion III—last November 21, 2014 in time for the Christmas season. The well-loved bakeshop’s branch in Nasugbu is the company’s 10th store in the whole of Batangas. The newly opened store is highly accessible to residents of Nasugbu as it is situated nearby the Town Hall, Town Plaza and the city’s Market. The branch is also close to one of the largest elementary schools in the city, Nasugbu West Central, and is also a 5-minute drive to Batangas State University—one of the most populated state universities in the province. “Reaching more families is one of our main ambitions in Red Ribbon. By opening a branch in Nasugbu, we wish to make more Batangueño families’ celebrations special through our delectable cakes and pastries, especially in time for the holidays,” says Zinnia Rivera, General Manager of Red Ribbon. The week before the opening of the new branch, Red Ribbon conducted a pre-opening event involving the Nasugbu West Central School and the Office of the Mayor. Red Ribbon organized games and introduced Buttermon, their first ever mascot, to over a thousand students and other Batangueños. When Red Ribbon opened its doors in Nasugbu, guests were delighted to free slices of the bakeshop’s well-loved, cherry-chocolatiest Black Forest Cake. The bakeshop’s crewmembers surprised the guests during the opening as they performed a dance number. The opening of Red Ribbon’s store in Nasugbu, Batangas signals the dedication of the local bakeshop in reaching more Filipinos, providing them the chance to treat their loved ones with delectable cakes and pastries. Residents of Nasugbu will now be able to make their celebrations extraordinary with well-loved products of the bakeshop such as the Black Forest Cake, Triple Chocolate Roll and Dedication cakes and pastries, such as the Butter Mamon, Ensaimada and Macaroons for a Cause. 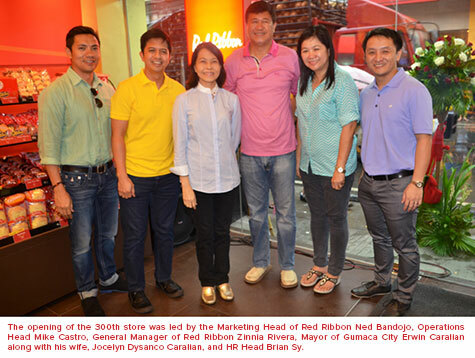 QUEZON, Philippines – Red Ribbon continues its celebration of its 35th year with the opening of its 300th store in Barangay San Diego Poblacion, along National Highway Gumaca, Quezon last August 30, 2014. Since its humble beginnings as a hobby-induced business in 1979 in Timog, Quezon City, Red Ribbon has grown to be a proudly Filipino business network under the country’s chain of fast food restaurants, Jollibee Foods Corporation (JFC). “Opening our 300th store is a milestone for Red Ribbon. We have truly grown from a small local bakeshop to one of the most well-loved bakeshops in the country. We are poised to open more branches to bring more sweet moments to Filipinos,” says Zinnia Rivera, General Manager of Red Ribbon. Since JFC’s acquisition of the well-loved bakeshop in 2005, Red Ribbon has continued to further its commitment in making celebrations and everyday moments sweeter among families and friends through their products. “Reaching every corner of the Philippines is part of our long term strategy. Opening our 300th store in Gumaca allows us to reach more Filipinos in Southern Luzon,” added Rivera. The newly opened store is the company’s third branch in the whole province of Quezon. On August 24, 2014, a week before the actual opening of the new branch, Red Ribbon gave a sneak peek to the residents of Gumaca on the coming of a Red Ribbon closer to their homes. 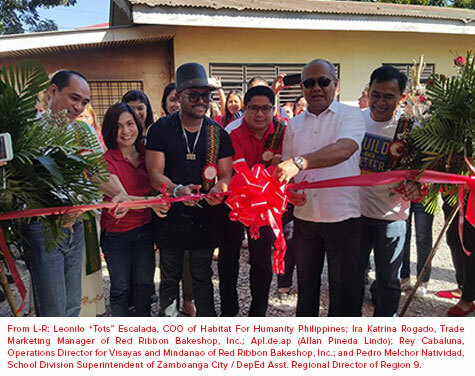 Members of Red Ribbon surprised the residents by performing and teaching the Macaroon Dance, popularized by international Filipino artist Apl.De.Ap, to children. A cake competition titled “The Sweetest Dedication Cake” also took place where the mothers and their kids had a hand at placing their own personalized messages on chocolate dedication cakes. The opening of the 300th store signifies Red Ribbon’s continuous expansion around the country to provide Filipinos a chance to treat the ones they love with well-loved Red Ribbon products. Residents of Gumaca will now be able to enjoy delicious cakes and rolls such as the Black Forest Cake, Triple Chocolate Roll and dedication cakes and pastries such as the Butter Mamon, Ensaimada, and Macaroons for a Cause. “We continue to grow and identify communities we have not yet tapped to bring our products closer to the homes of Filipinos,” says Rivera. To get more information about Red Ribbon’s products and to stay up-to-date on all things Red Ribbon, like their Facebook page, https://www.facebook.com/redribbonbakeshop or follow @IWantRedRibbon on Twitter. Red Ribbon is a Filipino-owned bakeshop with over 310 outlets across the country. Since 1979, Red Ribbon has been bringing together families and friends through their high quality and delicious selection of cakes and pastries, perfect not only for celebrations, but also to make each day worth celebrating. Growing up, children have always looked up to their very own mothers. Children have been amazed at how much their mothers could do so many tasks given so little time in a day. In between waking up early everyday to cook breakfast up until they kiss their children goodnight, mothers do so much more tasks. Moms set themselves as the best examples of what it means to love unconditionally as they always accept their sons and daughters despite the mistakes they have made. Through the dedication of mothers in ensuring the happiness of their families and by not showing signs of being tired, children have seen the strength of their moms. Simply, for most of us, our mothers are one of our greatest idols. This coming Mother’s Day, show your mom how grateful you are for having her in your life. Show off how much you have learned from her by surprising her with the first meal you have cooked with her. You could also write her a letter expressing how much you idolize her because of the many times that she has shown herself as the best role model in your life. Also, don’t forget to take a selfie with your mom, and post on your Instagram or Facebook, to show off how much you love her. After a day full of wonderful surprises, the best way to put the cherry on top is by giving your idol the perfect treat she deserves—Red Ribbon’s limited edition Mother’s Day Black Forest Cake! 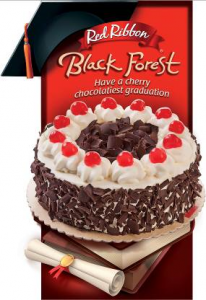 Red Ribbon knows how special this day is for your mom so they made their classic Black Forest Cake even more special by making it chocolatier with a chocolate fence surrounding the cake! The moist chocolate cake is filled with chocolate filling and cream with cherry bits, and topped with chocolate shavings & red cherries. You could treat your mother with the limited edition chocolatier Red Ribbon’s Black Forest cake, for only P560.00! Pandesal has always been a part of the lives of Filipinos. From morning breakfasts to afternoon snacks, the Filipino bread is enjoyed by children and adults alike. Though pandesal is delicious on its own, Filipinos have all found different ways to take delight on the classic bread. Children have seen their parents dip their pandesal in coffee every morning. Some Filipinos feast on their pandesals with the fresh kesong puti. There are also some who stuff their pandesal with slices of hotdogs, for a more filling snack. Another Filipino snack that has won the hearts and filled the street corners of Filipinos is the pork barbecue. Its savory, barbecue taste paired with your choice of either sweet or spicy sauce or just plain vinegar dip makes this mouth-watering street food another Filipino classic. Realizing that Filipinos enjoy the classic soft bread paired with various fillings and spreads, well-loved, local bakeshop, Red Ribbon, introduces a new savory product which Filipinos will surely enjoy—Red Ribbon’s Pork Pandesal! The Pork Pandesal is Red Ribbon’s take on the classic pandesal, pairing it with pork barbecue. Combining Filipino favorite snacks, pandesal and pork barbecue, Red Ribbon offers a soft, moist bread, loaded with chunky bits of pork barbecue. Stuffed with generous amount of pork filling, Red Ribbon’s Pork Pandesal is the perfect morning and afternoon snack for your children. The Pork Pandesal can be enjoyed as a snack by your children for an affordable price of P23.00 per piece. As the soft bread is packed with pork barbecue, it could be enjoyed as a savory meal on its own. The pandesal could also be easily stored in a lunchbox, making it convenient for children to bring the new snack anywhere they go. When your child is taking a break, he could simply take out the pandesal and consume it instantly as it is ready-to-eat on its own—no need for plates or utensils. Starting April 28, 2014, Filipino families could have better mornings, and fun-filled afternoons with Red Ribbon’s tasty and filling, pork-stuffed pandesal, which will be available in select Red Ribbon stores in Metro Manila and Luzon. Enjoy Red Ribbon’s Pork Pandesal with a cup of coffee, or a glass of chilled juice every morning with the family. You can also have your children bring the Pork Pandesal as their baon for summer classes or family outings. With its great value for money and as a convenient, savory and hearty snack, Red Ribbon’s Pork Pandesal is another Filipino classic meant to be enjoyed by the whole family. ©2019 Red Ribbon All Rights Reserved.